While rhino poaching has decreased in the country overall according to recent stats, KwaZulu Natal is one of the provinces in which it has increased. And for Dr. Dave Cooper, a vet with over three decades’ of experience, the last few days have been some of the worst. “Yesterday honestly rates as one of the lowest points in my life as a wildlife vet, pretty much an emotional breaking point – but it’s not the first time; it’s something that is happening far too often. “I don’t think it is possible to explain to somebody who hasn’t experienced this nightmare, what even one death scene does to you. It’s traumatic and haunting, and cannot ever be erased from your mind. I’ve attended over 400!! “So, how was yesterday even worse than all the others? “Well – at first light on Saturday I flew out to do a post mortem on a dead rhino discovered the previous day. (I had been at other poaching scenes on Thursday and Friday already so this had to wait until Saturday). “While flying, we discovered a second body. Then a third. And then a fourth. FOUR! Can you even try and imagine what it’s like to experience so much death and destruction, all the time?! 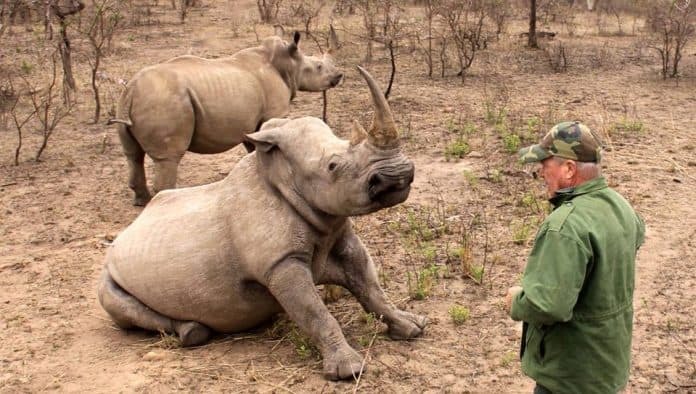 “And then – just as I arrived at our friend’s home at midday, the phone rang again with news that there was a tiny orphaned calf, from one of those murdered rhino. “And so another mad race back to the game reserve to get to him in time, all the while thinking this was going to be number five! “The poor little guy is only about three months old, small enough to load in the helicopter. It’s always touch and go. But thankfully, with the devoted attention of my colleague Dumi Zwane all night at our bomas (and with 9 orphans, THAT’s a full time job too), the calf has started drinking and looks like he’ll be ok.
“If he hadn’t made it I’m not sure what I would have done.“I just cannot describe how utterly hellish yesterday was for all of us out there.